A patriotic salute to Iowa veterans is woven into a weekend of activities surrounding the birthday party in West Branch for the town’s famed native son and Iowa’s only president, Herbert Hoover. Hooverfest events are underway already, according to Becky Allgood, executive director of the Hoover Presidential Library Association. “We have the 22nd annual Hooverball National Championships with over 30 teams,” Allgood says. “We have the Vietnam Moving Wall, it’s a smaller replica of the National Vietnam Wall. It’s 254-feet so it’s a beautiful exhibit.” Hooverball was devised in the early 1930s for the then-president to play on the White House grounds to keep him physically fit. 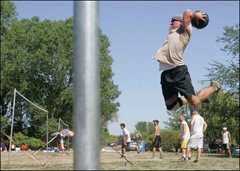 The game resembles volleyball but is now played by enthusiasts in eastern Iowa with a four- or six-pound medicine ball. Allgood says military veterans are welcome at Hooverfest, as all VFWs in the state have been invited, in addition to all 700 American Legion posts across Iowa. “If you’re an Iowan, you’ll be very proud and you really want to come to this,” Allgood says. “These exhibits are phenomenal.” Performers at Hooverfest include the Celebration Iowa Singers and Jazz Band and the Air Force Jazz Band. Admission, shuttles and parking are all free. Saturday’s events end with a fireworks show, choreographed to music. For details, visit “ www.hooverfest.org “.